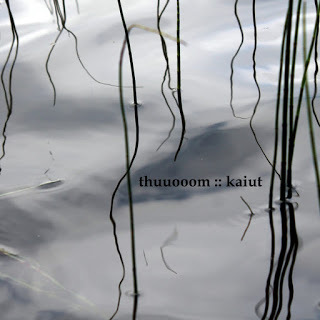 Comment: behind the project Thuuoom is a sonic experimentalist Tuomo from Finland who has been issuing music since 2008 under his own imprint Textural Healing. In the meantime I was quite worried because of having had no releases by the artist for a while. However, in the recent year he has issued four outings so date. I did recently review his three-track issue Aste EP, which was the chaser of the album Kaiut because the music for both albums had been conjured up in one and the same session. Aste EP was a highly microtonal, even abstract case, which contains a very few information you could have dealt with it. It was rather a state of mind. Kaiut is a longer issue physically containing 6 pieces and clocking in at a 65 minute. Its soundscape is more bright and more evocative. For instance, the opening composition Electride starts off with tanpura-alike drones, which later will convert into more restrained yet somehow burning drones. Indeed, one could perceive some lurid frequencies coming out of it. The same will be represented in the next tracks yet with slightly different modifications in tonality and intensity (I guess Tuomo uses some sounds of found sound origin). At times it sounds as if coming from a remote wasteland to ghost you with uncommon sounds and a conception. One could imagine that the artist exploits the tape head for recording music being made up of coal and lignite. From the album`s sleeve you can see he has used an acoustic guitar though you could not hear clear-cut guitar sounds on it. Thereof it can be admitted these instruments he has exploited on it are not things on their own but just the bare matter for further sonic processings. Indeed, those brownish sounds predominate on the issue with some brighter slots and slight turns and subtle changes. In a word, get it. It is a specific yet intriguing issue for all drone and sound art inflected devotees.